Another Women & Wisdom Card Reading Day here at Kindred Spirit Center. We pulled a card for you from Linda’s new Romance Angels Oracle deck. The card that fell is Engagement. Your love life is ascending to a higher level of commitment. Congratulations! this card signals pending nuptials, beginning with a romantic engagement. Even if you’re not presently in a relationship, the Romance Angels can see one upon your horizon. This card comes to you as reassurance–specifically so that you’ll choose to release any worries about whether you’ll get married…because you will. Deep romantic love, in which you feel treasured, is “in the cards” for you. The deeper meaning of this card relates to commitment. First, you commit to taking care of yourself. You establish boundaries about what you will and won’t accept in your relationships and in other life areas, such as career, home, lifestyle, and so on. Next, you honor your self-commitment by taking decisive action and telling others how you truthfully feel about their behavior. 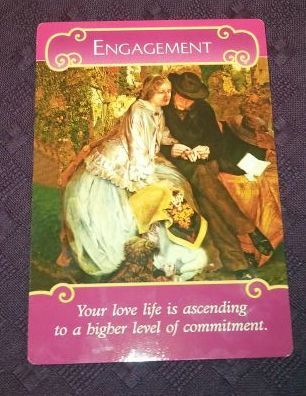 As you commit to yourself, the universe sends you additional experiences of loving commitment, including the promise of marriage.